← Smile! Make People Wonder! I didn’t really start out to collect lighthouses. They were so appealing, though, bright and cheerful beacons to steer ships to safety, all so different, representative of rocky or otherwise dangerous points around our vast shoreline. I have now a very modest collection of lighthouses from favorite coasts we’ve visited and from others where sisters and friends have gone and brought me mementos. I have, among others, one from Maine, several from St. Simon’s Island, one from Cape Canaveral, one from Aruba, my newest one acquired last summer on a memorable family vacation. I didn’t plan to collect bottles either. My first one, I think, was a smelling salts bottle used by my great aunt De, an oddly shaped bottle with a stopper in the top. I have a great interest in things of the past and I’d included Aunt De in some of my writing. Her character has been immortalized by family stories, such as her love of many cats and how she cooked rats to feed them. Then there were several colorful little bottles we found at our old place Lane of Palms. Seeing my enjoyment of interesting bottles, my son William at a very young age, purchased an old (very old) flask-type mayonnaise bottle at an antique store and gave it to me for Christmas. Naturally, that is now a treasure. Being a Georgian, I was excited when I acquired one of the original small coke bottles. And so it went! Everyone who loves to pick up seashells on the beach also enjoys keeping at least some of them. Early on, I realized my desire to keep seashells was going to require some kind of heavy discipline. I found a large, two-foot-high clear bottle perfect for collecting seashells and I became very selective about what I’d bring home. My collection includes at least one shell or small stone from every seashore I’ve visited whether St. George Island, Florida, Hawaii and Alaska, the rocky coast of Maine, the shores of Lake Superior, the Oregon Coast, the shores of the Sea of Galilee and even the Dead Sea, and the intriguing beaches on the island of Aruba. More than once, someone has offered to give me his/her shells so I can go ahead and fill my bottle to the top. But no! This is my collection and the main fun is in building it. When my bottle is full, I’ll have to stop bringing shells home! My sisters collect dolls so I steered away from that area of accruing. But somehow I’ve ended up with a few treasures I can’t readily part with: two or three from my childhood, one beautiful doll from Savannah, Georgia who looked at me from amongst her antique companions and simply said she must go home with me. Her name is Savannah. Then there are the skaters I used only to bring out for display at Christmas until one year I couldn’t bear to cover all their little bright faces up and decided they must skate all the year around! My favorite doll is one my sister, the doll dressmaker, clad in clothes to represent our mother when she was a blonde-headed farm girl. 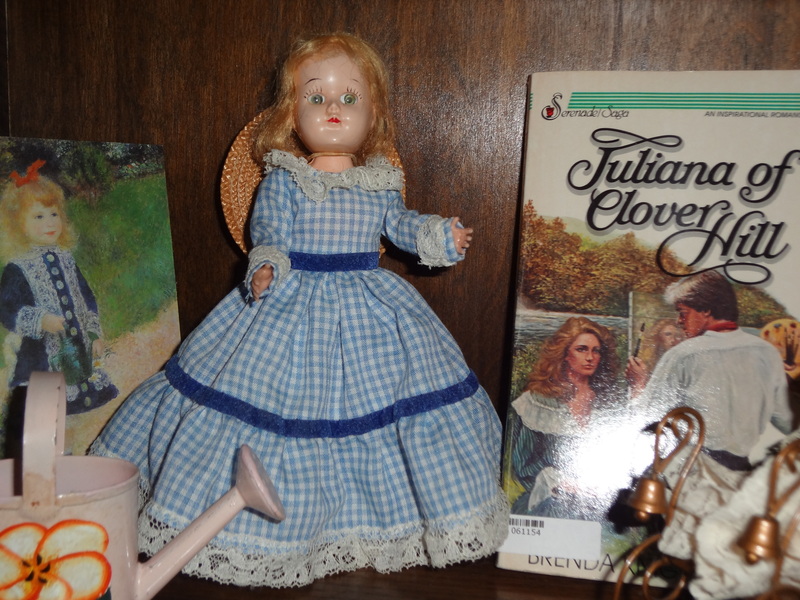 I wrote the fictionized version of my mom and dad’s romance,(“Juliana of Clover Hill” pictured below) and Juliana dressed in blue gingham is just about the height of that colorful paperback. The collections I really planned to do were those of postcards and thimbles. Everywhere my husband and I have gone for many years now can be remembered by a thimble in my collection displayed in an old printer’s tray, and/or by at least one postcard. Sisters and brothers and others have brought me thimbles from their travels as well, so I have one for many of the states, for several countries, and for other categories, such as wildflowers, Christmas, and historical sites. My most unusual one is the one my sister Pat gave me. It’s a small regular, real thimble, dark grey metal. She said the lady who gave it to her had been given it by her grandmother who sat as a child on Abraham Lincoln’s knee! Books don’t even count as a collection. Books are simply a part of one’s life. That is another topic entirely. Same for pictures, scarves, hats, etc. Some things I’ve learned recently about collections: they’re easier to write about than to move, they’re much more interesting to the collector than to anyone else, and they are fun reminders of happy experiences and wonderful people. I’ve realized museums would be hard-pressed without collections, but we don’t want our house to be a museum! The culmination of this little feature on collections is to remind myself that moderation in collections is wise, that we don’t necessarily need physical reminders to help us enjoy events and people, and that letting go of things is sometimes very, very wise. Hey, there are very interesting collections one can make that take up almost no space. For instance, a collection of interesting bumper stickers or odd names of businesses or apropos names of professional people, like the surgeon named Dr. Payne. But the best collection we can make is the memorization of poems and of scripture. Now that collection will stand you in good stead when you’re stuck somewhere without your Bible, or trying to go to sleep in the wee hours, not to mention horrific times like sitting by someone in the hospital.